Download "Manager of Career Services 120 S. LaSalle Suite 2000 Chicago, IL 60603 312.857.9902 joinbw.com"
3 HOW WE RE DIFFERENT Baird & Warner knows what it takes to be successful. We have a plan that guarantees your success. Ongoing training to increase your market knowledge and to utilize the tools necessary to grow and enhance your business In-depth business planning to create a clear vision of results and goals you want to achieve Regular coaching from your manager to help you meet your goals Baird & Warner s resources and tools have been developed with one objective to help you generate business through: Business Support Professional Development Marketing Tools and Technology Lead Generation Value-Added Services BUSINESS SUPPORT One powerful network. As the largest independent broker in Illinois, our network of 23 offices and more than 1,500 Sales Associates plus our affiliation with Leading Real Estate Companies of the World, offer you tremendous office-to-office, national, and international referral opportunities. And no matter where your business takes you in metropolitan Chicago, you are welcome to use the resources of any Baird & Warner office. 5 BAIRDWARNER.COM Chicagoland s #1 Real Estate Website. Baird & Warner s award-winning website is consistently rated by consumers, the press and independent online tracking sources as The Best Website for Finding Real Estate. Our leadership position gives our Sales Associates an unmatched competitive advantage in the market place. PROFESSIONAL PHOTOGRAPHY Set your listings apart from the competition. Professional photos are taken of every one of your listings at no charge to you. Up to 10 photos are automatically uploaded to your site and the MLS, and are available for flyers, advertising and promotional materials. Bairdwarner.com maximizes the beauty of your listing s photos with its Full Screen Photo Viewer. 7 BAIRD & WARNER MARKET SUMMARY The largest database of active registered buyers in our market lets you stay in touch with your sphere while providing valuable information to your clients and prospects. Powerful search criteria Sales Associate branded Client listing feedback saved favorites Sales Associate has view of client s searches Detailed traffic statistics available for weekly Internet Activity Snapshot to sellers Drip market the latest sold listings as well as historical trending data to members of your sphere, based on specific GEO-coded locations. Each automated is sent from you and includes your photo and contact information. 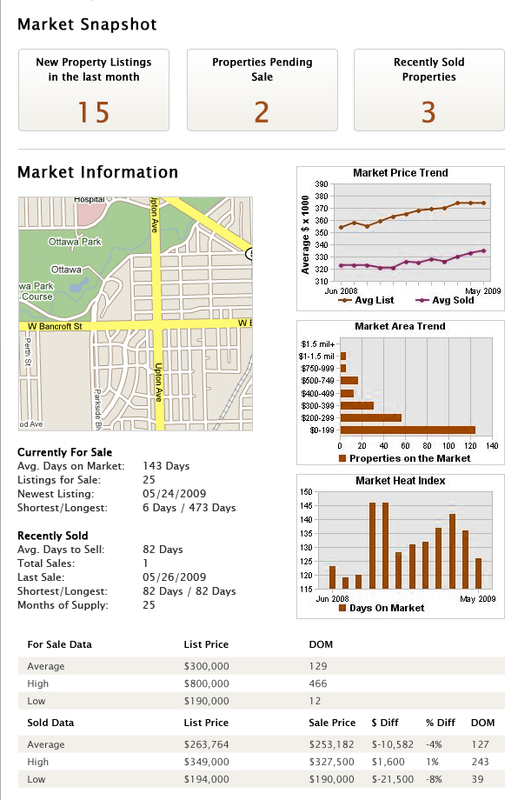 9 B&W ONETOUCH PROPERTY REPORT Give your sellers a more extensive look at their Internet Visits. 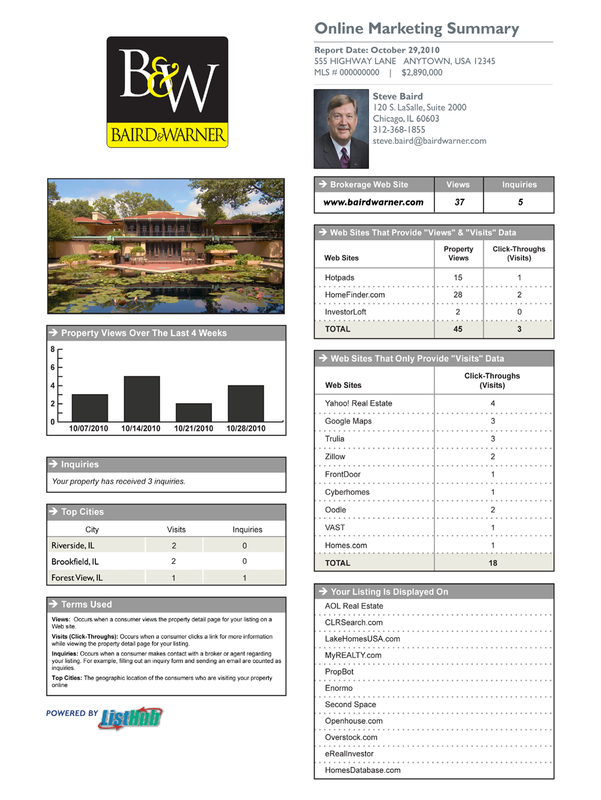 The Baird & Warner OneTouch Seller Report is a detailed analysis of your listing s online performance, showings and open house activity. This customizable report also allows you to communicate marketing, communication and advertising information to your clients. And because this report is powered by Google Analytics, you and your clients can expect the highest level of data accuracy. 10 CHICAGOTRIBUNE.COM Better promotion on the #1 newspaper website Baird & Warner has developed a strong partnership with chicagotribune.com. Baird & Warner properties on chicagotribune.com are shown in detail twice as often, are viewed twice as much on search results pages, and enjoy a click through rate that s twice as high as our next closest competitor. * Reaches more local home buyers than any other real estate website All leads go directly to you, the Listing Sales Associate with no charge and no referral fees! With 3.7 million unique visitors each month, chicagotribune.com boasts more reach than any Chicago real estate site *According to the Chicago Tribune Media Group s Q online performance report MAXIMUM EXPOSURE Your listings are promoted on hundreds of websites through the nation s #1 listing distribution network Baird & Warner has an aggressive strategy for attracting home buyers to your listings. By distributing your listing information, along with high-quality photographs, to a wide array of premier consumer websites, we make sure that we maximize every opportunity to attract qualified buyers. The best part is that all leads go directly to you! 11 MYBAIRDWARNER.COM Your virtual office. Your Baird & Warner intranet site keeps you connected to tools, resources and opportunities 24/7 no matter where you are. On the site you ll find: Listing and Marketing Materials Interactive Contracts and Forms My Office page News Stories Training Company Announcements SALES ASSOCIATE HELP DESK Personal, friendly technical support when you need it. We ll help you: Configure your wireless network card Connect to a B&W printer or copier Sync your smart phone with our system And much more! 13 XPRESSDOCS High-quality postcards, flyers and brochures in your hands overnight. Easy-to-use system allows you to customize a broad range of marketing materials to suit your specific needs: Promote your listings with standard property marketing Steve Baird Promote your high-end listings with luxury property marketing Promote yourself with general marketing INTERACTIVE MARKETING WITH RELATIONSHIP MANAGER Stay in touch with your clients through an easy-to-use contact management tool. Baird & Warner Relationship Manager offers: Sphere of Influence Database Personalized, automated e-greetings that can be sent to your contact list Customized Just Listed/Just Sold/Open House e-greeting templates Custom-branded, pre-written, effortless e-newsletters that go out automatically right from your website CUSTOMIZABLE BROCHURE TEMPLATES ON MYBAIRDWARNER.COM Stylish, customizable brochure templates allow you to create on-the-fly marketing materials that you can print on your own. 14 ONLINE AD WIZARD & CRAIGSLIST Baird & Warner Sales Associates have access to Online Ad Wizard, a tool that generates html ads for Craigslist and for use in e-blasts. Increase your listing exposure Generate more leads Market yourself and your listings for free BAIRD & WARNER MOBILE SEARCH Increase your Internet lead volume as consumers search for properties on the go. All calls on B&W listings go directly to the listing agent via an that includes the caller s phone number and requested property information Calls on co-op listings are routed to our e-business center and are distributed to our e-business Sales Team B&W TEXTING SOLUTION Buyers can text BW to and receive basic listing info and photos, while the lead is sent directly to you. Baird & Warner associates receive thousands of leads each month from the B&W Texting Solution Receive the leads, even if you don t have a listing No referral fees! 15 BAIRD & WARNER LUXURY PORTFOLIO Luxuryportfolio.com promotes your luxury listings with worldwide exposure, specially branded advertising, and exclusive marketing materials. Showcases more $1 million+ listings than Christie s and Sotheby s networks. Maintains traffic from 200 countries. Home prices are converted to 60+ international currencies. Offers content in 9 languages. $250 $222 BAIRD & WARNER RELOCATION & E-BUSINESS $200 LeadingRE $176 $172 Baird & Warner gives you more opportunities for referrals and leads. Baird & Warner is a member of Leading Real Estate $150 $100 Coldwell Banker RE/MAX $117 Prudential Companies of the World, the world s largest network of leading independent residential real estate firms that handles more relocation than Re/MAX, Coldwell Banker, Century 21 or Prudential. Baird & Warner Sales Associates closed 80% of LeadingRE s 2011 referral business in Chicagoland. $50 Baird & Warner E-Business distributes hundreds of referral opportunities monthly. Baird & Warner Business Development closes over $0 Volume shown in billions of dollars Source: Actual member statistics for LeadingRE for 2011 production. $300M for our Sales Associates annually. Baird & Warner is the broker of choice for the top relocation management companies around the world. 16 A L L Y O U R N E E D S U N D E R O N E R O O F BAIRD & WARNER FINANCIAL SERVICES provides a broad range of custom-tailored mortgage services for your clients. B&W Financial Services is one of the leading mortgage companies in Illinois, providing quick pre-approvals, back-up mortgage approvals, and a full line of mortgage products. Also, we fund our own loans, so your clients financing will never be held up by a third party lender. BAIRD & WARNER TITLE SERVICES offers complete title services from contract to closing. We offer a network of 400+ real estate attorneys, convenient closing locations, a quick turnaround commitment, and some of the most competitive rates in Northeastern Illinois. Get the Most Buyers Contacting You 15 Tips for More Leads from Your Existing Marketing using Buyer Assist by Realtor.com Buyer Assist by REALTOR.com 1 8 million consumers visit REALTOR.com every month. We ve created this handy checklist to help you choose the real estate CRM and marketing system that checks off all the right boxes. It s Different Here In an industry of sameness you can stand out. With the work done that fast, you ll be able to enjoy alot more free time thanks to the Open House Toolkit. Our sites give you the latest technology that can help you efficiently manage and grow your business. The presentation will begin at 10:30 a.m. MST.